Poke (psst, it’s pronounced po-kay, according to those in the know) bowls are all the rage right now and we love them – they’re so easy to customise with your favourite flavours! 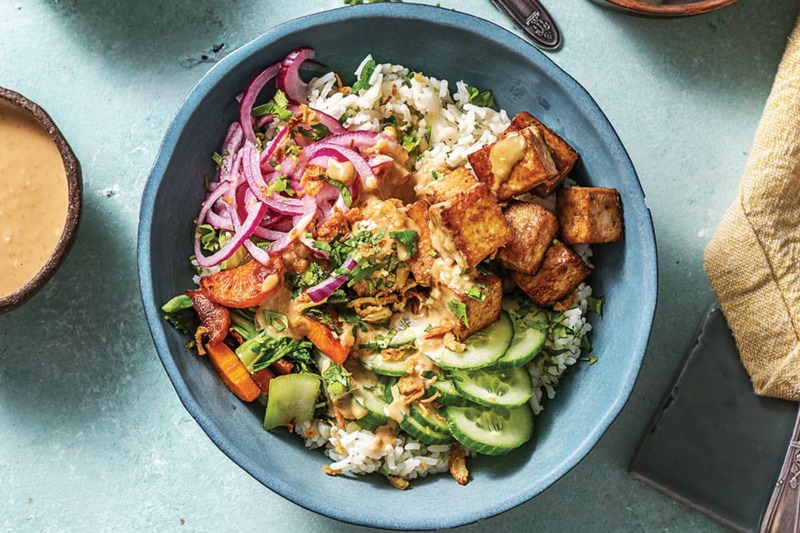 This veggie version uses umami-rich tofu, Asian greens, carrot and cucumber and adds a nutty sesame sauce to tie the whole thing all together. In a medium saucepan, bring the water (for the rice) and the crumbled vegetable stock (1 cube for 2 people / 2 cubes for 4 people) to the boil. Add the basmati rice, stir, cover with a lid and reduce the heat to low. Cook for 10 minutes, then remove from the heat and set aside, covered, for another 10 minutes, or until the rice is tender and the water has absorbed. TIP: The rice will finish cooking in its own steam so don't peek! While the rice is cooking, thinly slice the red onion (see ingredients list). 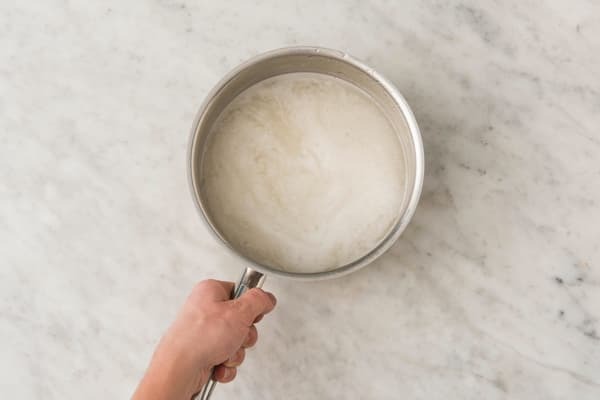 Combine the rice wine vinegar (3 tbs for 2 people / 6 tbs for 4 people), the water (for the onion), a generous pinch of salt and a generous pinch of sugar in a small bowl. Scrunch the onion in your hands, then add to the pickling liquid and stir to coat. Set aside until just before serving. 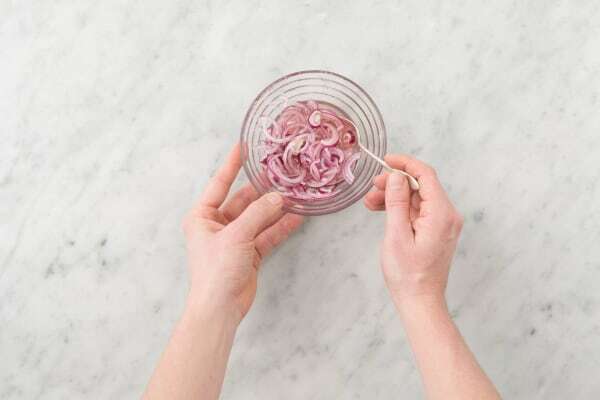 TIP: Toss the onions a few times during pickling to keep them submerged. 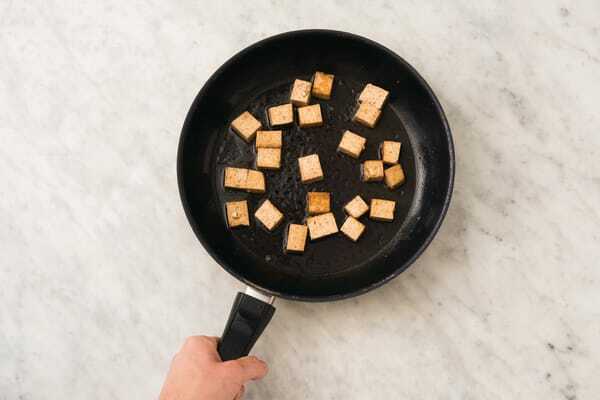 While the onion is pickling, cut the Japanese tofu into 2cm cubes. Thinly slice the carrot (unpeeled) into half-moons. 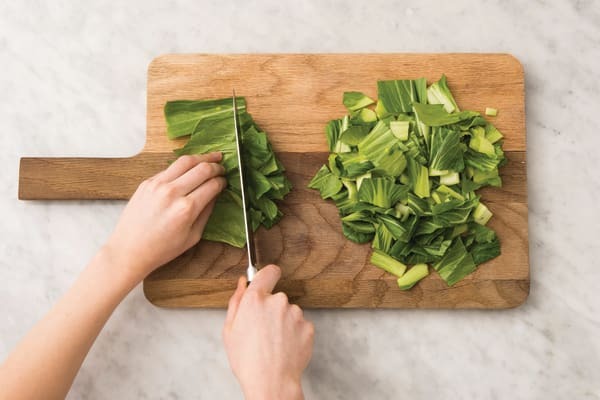 Roughly chop the Asian greens. Thinly slice the cucumber. Roughly chop the mint. Heat a medium frying pan over a medium-high heat. 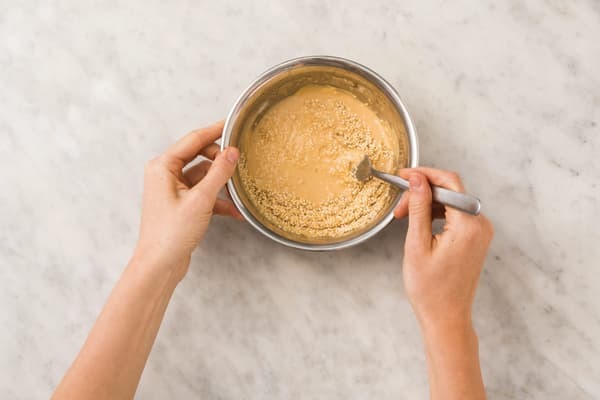 Add the sesame seeds and toast, tossing, for 3-4 minutes or until golden. Transfer to a small bowl. Add the mayonnaise, sesame oil, soy sauce, sugar and remaining rice wine vinegar. Mix well and set aside. Return the frying pan to a medium-high heat with a drizzle of olive oil. Add the tofu and cook for 2 minutes on each side or until golden. Transfer to a plate. Add a drizzle more olive oil and the carrot to the pan and cook for 2 minutes, or until tender. Add the Asian greens and cook for 2 minutes or until wilted. Season to taste with salt and pepper. Drain the pickled onions. 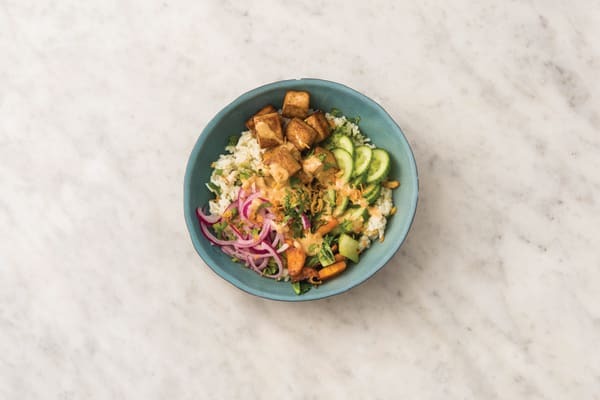 Divide the rice between bowls and top with the cucumber, Japanese tofu, carrot and Asian greens. Spoon over the sesame sauce and garnish with the mint, pickled onions and crispy shallots.